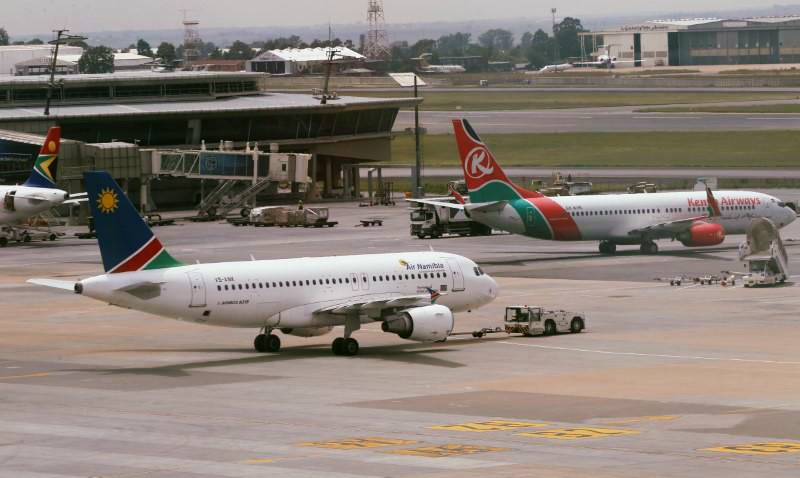 Pictured: Aircraft from Air Namibia and Kenya Airways parked at the O.R. Tambo International Airport in Johannesburg, South Africa. A scandal that could have harsh negative international and financial repercussions erupted when an Air Namibia aircraft got stuck on the apron of the O.R. 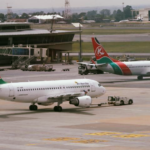 Tambo International Airport in Johannesburg for nearly six hours after four flight crew members were prevented from boarding the aeroplane because they were too drunk to safely conduct their duties. Besides the inconvenience caused to passengers, the delay of the early morning flight from Johannesburg to the Hosea Kutako International Airport in Windhoek on Monday also severely delayed connecting flights to Angola and the economic centres of West Africa. Mr. Paul Nakawa, Air Namibia’s Manager of Corporate Communications, confirmed that the operations of flight SW722 were severely delayed due to the incident involving the intoxicated flight crew members. Nakawa said Air Namibia was forced to send a fresh crew from Windhoek to operate the flight. This resulted in a five hour and 52 minutes delay in the flight. He said the four crew members were flown to Windhoek as passengers and upon their arrival in Windhoek, the crew members who tested positive for excess alcohol were presented with the allegations leveled against them, and were given 24 hours to supply reasons in writing as to why the national airline should not suspend them. Nakawa said the actions of the crew members were against the state owned company’s policies and international aviation regulations. The crew members specifically breached the regulations of the Air Namibia Cabin Crew Manual, that states under section 4.12. Alcohol and Drugs: Cabin Crew (NAMCAR 121.02.2) that cabin and flight crew are not permitted to consume alcohol in any form for eight hours prior to their duty period, including crew on standby, and while commuting prior to operating a flight in the same duty period or split duty period. Operating Cabin Crew will not, under any circumstances, be permitted to consume alcohol on board Air Namibia aeroplanes. Nakawa elaborated on Air Namibia’s position and said that the airline being the national flag carrier has to comply with all local and international regulations and thus does everything within its powers to ensure safe operations. He said flight crew members also attend recurrent training to ensure that they are up to speed with their responsibilities. The airline conducts line checks and has various checks and balances in place to ensure that the safety of its passengers, crew and aircraft. Nakawa stated that Air Namibia will continue to conduct regular ad-hoc tests for drugs and alcohol, suitability of its crew and their general conduct on board. According to Nakawa the decisions taken by those staff members was their own personal choice, and they have to take responsibility for their actions. Nakawa did not identify the three crew members of the first officer who were suspended because of their scandalous conduct.